MORGANTOWN, W.V. – The city of Jamestown is losing its professional baseball team. On Monday afternoon, officials from the city of Morgantown, W.V. joined those from West Virginia University, the New York-Penn League and the Pittsburgh Pirates in announcing that the Pirates’ class A affiliate Jamestown Jammers would be moving to the West Virginia city for the 2015 season. During the media conference, Pirates President Frank Connelly explained why the Pirates wanted to relocate the team from Jamestown to Morgantown. In making the announcement, league president Ben Hayes also said that the effort to land a team in Morgantown has been underway for the past several years, especially with the university, city and Monongalia County working together to construct a new state-of-the-art ball park for the WVU baseball team. Hayes also extended his appreciation the community of Jamestown for being an integral part of the New York-Penn League since its inception in 1939. 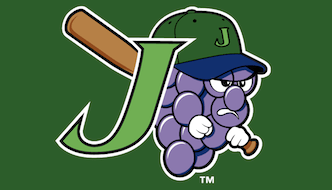 The Jammers are owned by Rich Baseball, which also owns the Buffalo Bisons (Class AAA; International League) and the Northwest Arkansas Naturals (Class AA; Texas League). While the city of Morgantown, WV was celebrating the arrival of a new professional baseball team on Monday, Jamestown Mayor Sam Teresi took time out during the monthly city council voting session to address the news. 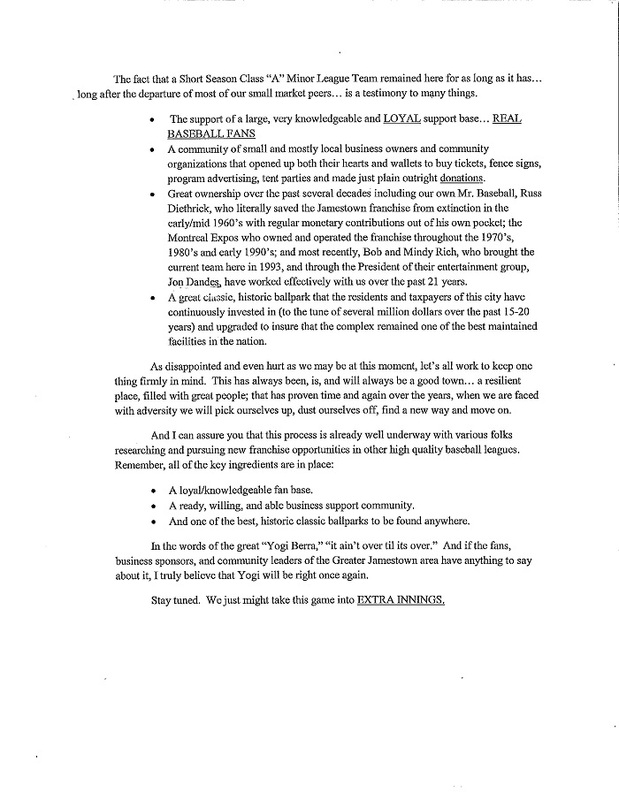 Teresi said that he and so many others are obviously disappointed that the team is relocating to Morgantown, but was also impressed that the community was able to hold onto a team as long as it did, considering the recent shift the New York Penn League was making to bigger and wealthier markets. The mayor also said that while its disappointing to see the New York Penn League leave town, there is an effort by local stakeholders to start looking into other leagues with hopes of bringing another team to Jamestown. 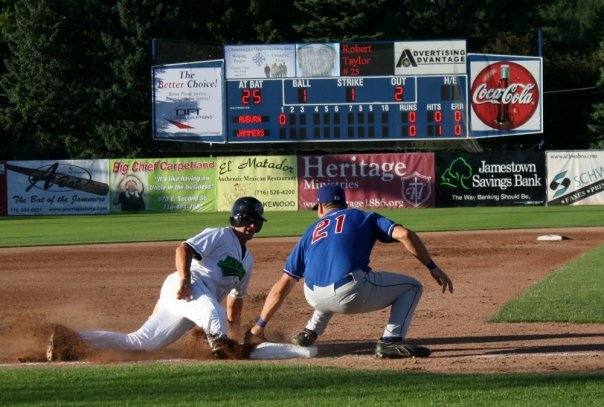 During its time in the league, Jamestown as had several well known players and managers play professional baseball for the local team, including hall-of-famer Nellie Fox, Jim Leyland, Randy Johnson, Marquis Grissom and Andres Galarraga. According to the mayor, the annual economic impact of professional baseball on the city is close to $3.5 million. 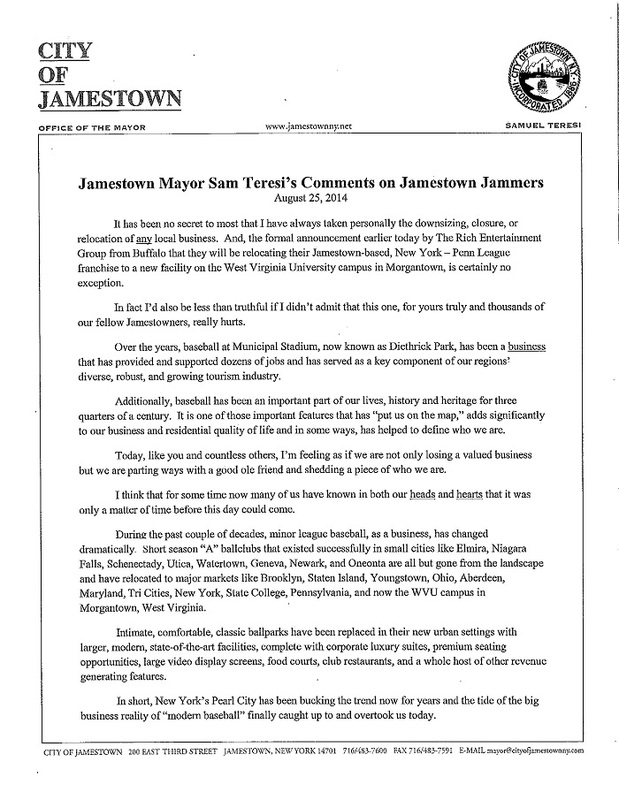 Read Teresi’s Full Statement on the Jammers Relocation below, or Click Here for PDF version.